This brief post from the British Journal of Sports Medicine blog nicely presents the rationale for using strength training to improve the overall health of the elderly. I have reblogged it below. Specific information on progressive resistance training for the elderly is sparse but I found this amusing and helpful video on a Canadian site that provides some guidance for beginners. As we get older we begin to lose muscle mass, approximately 1% every year. But more importantly, the decline in muscle strength declines at a rate 3-times greater . The consequences of this decline in strength are significant, with lower muscle strength being associated with an increased risk dementia, needing care, and mortality. But should we accept this as our fate, or is there anything we can do prevent, reverse or at least slow this age-related decline? 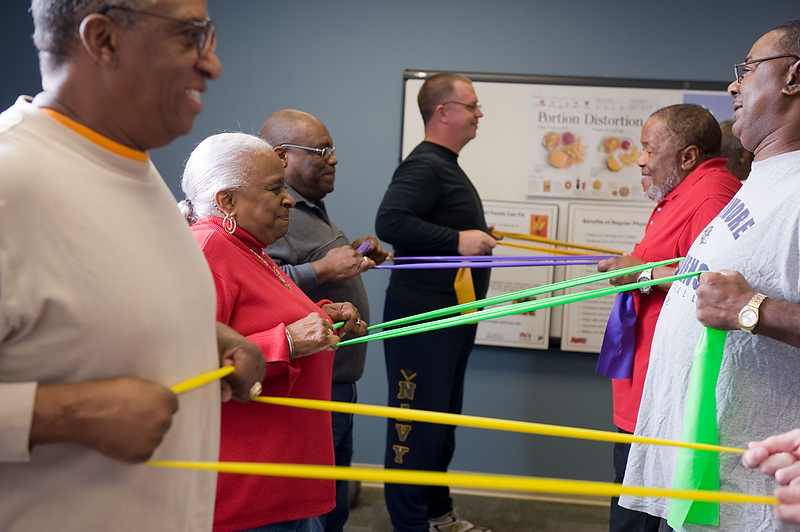 In 1990, a type of exercise called progressive resistance training, commonly known as strength training, was introduced to 9 nonagenerians living in a nursing home, specifically to treat the loss of muscle mass and strength, and the functional consequences of disability . After just 8 weeks, these older adults saw average strength gains of 174%, with 2 individuals no longer needing a cane to walk. In addition, one out of the three individuals who could not stand from a chair, was now able to stand up independently. Just take a moment to think about the results of that study. If I told you there was a medicine that you or a loved one could take, and it could make either of you strong enough to now get out of a chair, would you take it? What if you or a loved one had a hip fracture, and I told you that same medicine could help reduce the risk of mortality by 81%, and the risk of going in to a nursing home by 84%, as was shown in this study . Currently, the only way to take this medicine is by lifting weights, or pushing against resistance. A recent study from Britain,  showed an association between adults who participated in 2 days per week of strength training and a 20% reduction in mortality from any cause, and a 43% reduction in cancer mortality. Data from the Women’s Health Study in the US published at a similar time were very similar, with women reporting up to 145 minutes per week of strength training having a 19-27% reduced risk of mortality from any cause . So where does the benefit of strength training come from? First and foremost, it is anabolic in nature (meaning that it can stimulate muscle growth) making it the only type of exercise that can address the age-associated decline in muscle mass and strength. Within our laboratory at the University of Sydney, we have shown that we can use this type of exercise to improve cognitive function in adults who have subjective complaints about their memory . What’s important though, is that there was a direct relationship between strength gains and improvements in cognition, and so maximizing strength gains should be a key focus if you want to maximize your benefit . This type of exercise has even been taken into hospitals and used in adults with kidney failure undergoing haemodialysis, where it was shown to reduce inflammation, and improve muscle strength and body composition . Other laboratories around the world have also used strength training to increase bone strength in postmenopausal women , help manage blood sugar levels in adults with type 2 diabetes , as well as to counteract the catabolic side effects of androgen-deprivation therapy for men with prostate cancer . Not to mention its benefits to sleep , depression  and recovery from a heart attack . So it is no surprise to see that the Australian  and UK  public health guidelines for physical activity recommend we take part in activities such as strength training 2-to-3 days per week. Unfortunately however, these recommendations lack detail and guidance on intensity and frequency. A key theme in all the randomized controlled studies discussed above, is that not only were exercises performed at least 2 days per week, but they were fully supervised, used machine and/or free weights, and were done at a high intensity, which is commonly set to 80% of an individual’s peak strength. It is for this reason I like to focus on the guidelines put forward by The American College of Sports Medicine (ACSM) . The ACSM advises that everyone, including older adults do at least 2 days of progressive resistance training, which is to be performed at a moderate (5 – 6) to high/hard (7 – 8) intensity on a scale of 0 to 10, involving the major muscle groups of the body. So if you are looking to maximise the benefit from your time in the gym, or looking to make a positive change to your lifestyle, remember that there is medicine you can take; Try lifting some weights or doing other forms of strength training, 3 days a week, and importantly, make sure it feels moderate to hard. Not only will it add years to your life, but life to your years. Since college I have regularly done weight training 3 times per week As I get dangerously close to age 65 and joining the ranks of the “elderly” I have ramped up the intensity of my workouts, working hard to forestall the sarcopenia that will ultimately be my fate. It’s actually a balanced presentation of this difficult question (although it includes the seemingly obligatory anecdote of a patient getting severe muscle aches and weakness on Lipitor) and I agree with the concept that patients should demand a good thoughtful explanation from their PCP if they are on a statin. Shared physician and patient decision-making should occur irrespective of age when a statin is prescribed. Unfortunately, the NY Times piece was triggered by and contains references to a weak observational study that was recently published in the Journal of the American Geriatric Society..
A much better article on this same topic was published earlier in January in what is arguably the most respected cardiology journal in the world (Journal of the American College of Cardiology). It contains what I think is a very reasonable discussion of the problem: the elderly at are a substantially higher risk of adverse “statin-associated symptoms” but also at much higher risk of stroke, heart attack and cardiovascular-related death than the young. reduced the risk of a composite endpoint (nonfatal MI, nonfatal stroke, or cardiovascular death) substantially by 49% (RR: 0.51; 95% CI: 0.38 to 0.69), and the risk was reduced by 26% (RR: 0.74; 95% CI: 0.61 to 0.91) in those ≥70 years of age. The efficacy was similar in individuals ≥70 and <65 years of age, indicating little heterogeneity in treatment effect by age. Today, nearly all apparently healthy elderly individuals have RCT evidence supporting statin efficacy. 3. The elderly compared to the younger are much more likely to have a nonfatal event which does not reduce their longevity but impacts their quality of life. Thus, patient preferences are critical important for well-informed shared decision-making. If a patient only values longevity, there are little data to support primary prevention with statins in people >65 years of age. On the other hand, if preventing nonfatal and potentially disabling MI or stroke is of value to the patient, it might be reasonable to initiate statin therapy. From this perspective, it is noteworthy that the relative importance that people assign to avoiding death compared with avoiding nonfatal events appears to be highly age dependent. Although younger individuals <65 years of age weigh avoiding death highest, elderly individuals ≥65 years put a much higher weight on avoiding MI or stroke than death, These differences are compatible with elderly individuals having a greater focus on quality of life and avoiding disability than on extending life. The older the patient, the higher the bar for initiating statins and I think in all patients a search for subclinical atherosclerosis (coronary calcium scan or vascular ultrasound) helps inform the decision. If you are >75 ponder all these factors and have an intense discussion with your doctor about taking a statin. If you are still on the fence after this discussion consider a compromise approach that I have outlined here.